Heversham Men in celebratory mood. 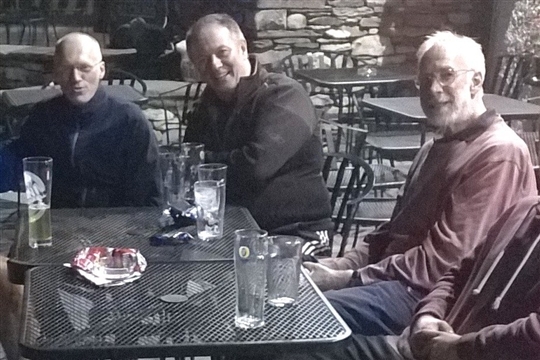 First team Captain Roger Aubrey (left), along with second team stalwarts Royden Davies (middle) and Graham Honeybone (right) and Mark Fox (photographer), enjoy a quiet non-alcoholic drink and healthy snacks outside a temperance establishment in Torver following their 5-5 draw with Coniston. In the absence of their established first team star players (Sam, Max, Albert, Louis, James, JK, Ben and Alex), these quiet, unassuming, low profile, Club players have made their own contribution to the first team's achievment of setting a new Kendal League record of 11 consecutive First Division titles. Heversham - a decade of success.